Foreign Secretary Philip Hammond has said it is vital that the European Union raises one billion euros (£800 million) to help fight Ebola. Speaking ahead of a meeting of EU foreign ministers, he said: "There is a major health crisis here. We've got a very short window to get on top of it and prevent the uncontrollable spread of this disease." The British nurse who survived Ebola after contracting the virus in Sierra Leone has returned to the West African country to continue treat others who are infected. William Pooley, 29, said he was delighted to be back in the country and would attempt to prevent "as many unnecessary deaths as possible". The 29-year-old, who was the first confirmed Briton to contract Ebola and was flown back to UK for treatment in August, arrived in the capital Freetown on Sunday. He will now resume work in an Ebola isolation unit run by UK medical staff. Mr Pooley said: "The real emergency is in West Africa, and the teams out there need all the support we can give them. "I am now looking forward to getting back out there and doing all I can to prevent as many unnecessary deaths as possible." 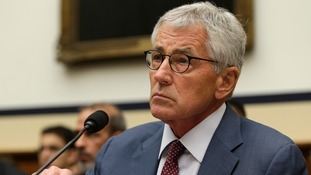 U.S. Defense Secretary Chuck Hagel has ordered the creation of a 30-member expeditionary medical support team to provide emergency help in a U.S. domestic Ebola response, a Pentagon spokesman has said. The team of five doctors, 20 nurses and five trainers could respond on short notice to help civilian medical professionals, spokesman Rear Admiral John Kirby said. The team will not be deployed to West Africa or elsewhere overseas. The United States will use two Spanish military bases to help in its efforts to fight the Ebola outbreak in west Africa. A statement from Spain's Defence Ministry said the US will use the bases in the south-west of the country to transport personnel and equipment to and from the affected region. Defence Minister Pedro Morenes agreed the deal with his US counterpart Chuck Hagel in Washington. Canada will start shipping its experimental Ebola vaccine to the World Health Organization. The WHO, in consultation with health authorities in the countries most affected by the outbreak of the disease, will decide on how the vaccine will be distributed and used, the Public Health Agency of Canada said. Canada will ship 800 vials of its experimental vaccine in three separate shipments, as a precautionary measure. Barack Obama has appointed an Ebola "czar" to help tackle breaches of protocol which took place in Texas, where the killer virus first appeared on US soil. The President has chosen Ron Klain, a lawyer who had served as chief of staff to Vice Presidents Joe Biden and Al Gore, to oversee the US response. The White House also said it would send senior personnel to Dallas, Texas, to help federal, state and local officials there trying to identify and monitor people who came in contact with three people who contracted the disease. Thomas Eric Duncan, the first person diagnosed with the disease in the United States, died last week. Two nurses who were on the team caring for Duncan have now contracted it and are being monitored. A woman who became ill in the Pentagon car park does not have Ebola, officials said. The public relations worker was put in quarantine at the Inova Fairfax Hospital and medical personnel took all needed precautions. But despite fears she may have recently having been in West Africa, her boss confirmed she had not been out of the Washington area. David Cameron has called for EU leaders to double their funding in the fight against Ebola. The Prime Minister demanded an £800 million pledge after writing to 26 fellow leaders and the European Council. Downing Street said at the moment the total contribution from the EU was just £400 million. Mr Cameron vowed to use next week's meeting of European leaders to press for more action. A dog owned by one of the nurses infected with Ebola in Texas is being cared for by a local animal shelter. The Dallas Animal Services and Adoption Center shared some new pictures of Nina Pham's dog Bentley being cared for by staff in protective suits. Nina Pham pictured with Bentley before she caught the Ebola.